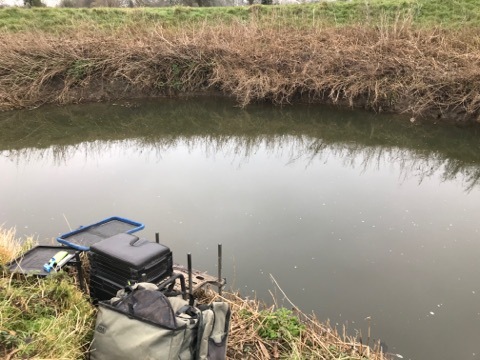 It got cold in the week and with hardly any rain, the river was back to being low and clear and with eleven booked in we’d have to use Hambridge again but how would it fish this week? We hadn’t had a frost and it actually felt fairly mild which hopefully was a good sign. I got to the bowling club for the draw and along with the regulars, it was great to see Ben Simmonds again and it’s always lovely to see Terry ‘The Toast’. Between me, Steve P and Baz we sorted out the pegs, pools and boards etc and when everybody had finished eating, it was time to draw. I was holding the bucket of hope and as people started pulling out pegs there was the usual array of face pulling as the anglers expressed their delight or disgust. Baz finally got his wish (after 104 years of fishing the Isle) as he’d drawn 128 for the first time, Big Frank was on 126, Steve P pulled out 125 and young Stu had the choice of 124 or 124a. 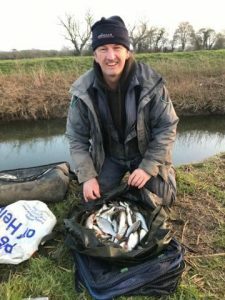 Adie drew 120 and despite saying he didn’t want it, I fancied it to do well, Terry and Fieldy were on 108 and 110 at Redbridge and as they hadn’t been in for a while it would be interesting to see how they fished. Ben, Jake and Karl were at Hambridge which just left one ball in the bucket and I pulled out 123 which wouldn’t have been my first choice. Frank won off it with over 18lb in one of the early matches but it hasn’t done much since, it’s just one of those pegs I can never seem to get on with although it did nearly 5lb last week so at least I should get a few bites. We got to the river and Stu had a look at 124a and 124 but decided on the latter which I thought might have been a mistake as it hasn’t produced the last couple of times it was fished. My peg looked really nice and I could get my box in quite low to the water. I set up a 1 gram bodied float to fish down the middle and a 0.6 gram DH16 for fishing across where there were two bits of cover which would hopefully hold a chub or two. On the menu for the day were the usual bronze and red maggots, casters and Bait-Tech Super Seed hemp. On the whistle I started with the heavier rig and two red maggots at 8.5 metres down the middle, feeding casters and hemp just upstream and also across but I wanted to leave that as long as possible before trying it. Second run through, the float buried and a fair bit of elastic came out before I netted a nice chublet of 8oz or so, next chuck I had a small dace come off as I shipped back and it felt like there were a few fish there so I thought I’d try two sections to hand. I had a small roach quite quickly but the next few bites resulted in minnows so I stuck another section on to inch the float through just this side of the main flow and tried a caster for the first time. The float buried and the strike met with a pleasing amount of resistance and I netted a decent roach. 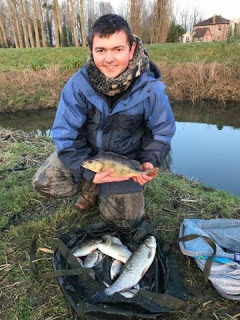 It was a bite a chuck and I was catching small roach, dace and gudgeon with the odd better roach and quite a few minnows (which I didn’t count) and after an hour I had 20 fish for around 3lb. The second sixty minutes was similar and I added another 15 fish for 2lb or so and was really enjoying myself and I was sure a chub would put in an appearance sooner or later. 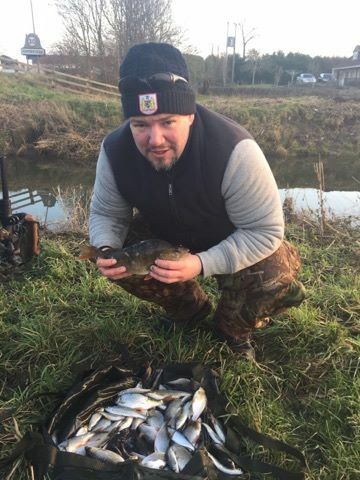 Going into the third hour, bites started to slow and I was catching quite a few gudgeon so I went a section further over and had a brief flurry of fish including a couple of nice roach although I bumped one and had one come off shipping back. With three and a half hours gone, bites had slowed right up so it was time to pick up the other rig and go across to the far bank for the first time, the flow was going back on itself and I tried holding back and inching it through but it just wasn’t quite right and after ten minutes I hadn’t had a proper indication and felt like I was wasting my time. I swung the rig towards the far bank on my left just off some dead reeds, I knew I was well overdepth but I started getting bites again and had several roach including a couple of net fish. A chap called Chris who’s a regular reader of the blog turned up and said he’d just come from Redbridge and he hadn’t seen them catch a lot, he stayed for a bit and I had several roach while he was there but because I was so far overdepth, a couple of times I didn’t see the bites and as I lifted the pole up, there was a fish on! He left me to it and went to see how the others were doing, I plumbed up again and shallowed the rig up but bizarrely, then I couldn’t get a bite! I added a few inches and started catching again, including some lovely roach. Chris got back and said the two below the bridge (Frank and Baz) were winkling out some small fish before wishing me luck for the last half an hour, it was nice to meet him again and as always it’s lovely when people say they enjoy reading the blog, cheers mate! 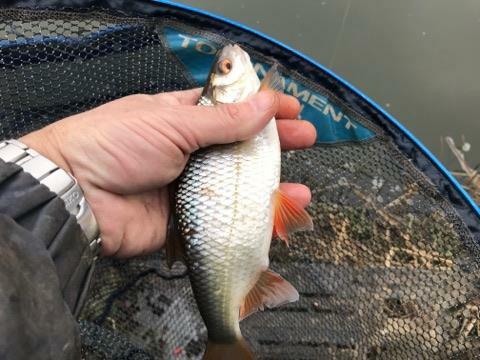 I had a few more roach including a couple of proper clonkers around 10-12oz and ended up with 77 fish (plus loads of minnows) and I was hoping if they averaged 2oz apiece I wouldn’t be far off double figures. I packed up and walked down to give Stu a hand with the scales, he said he’d had a cracking day catching two big perch, two chub plus quite a few roach. 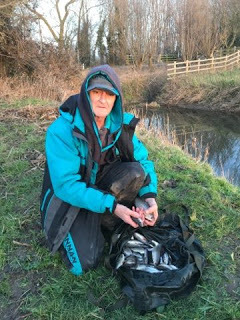 We started the weigh in with Steve who had 2lb 14oz which included some nice roach, then we got to Stu and he had a lovely bag of fish, out of interest we weighed the perch on it’s own and at 2lb 2oz it was a new pb for him, altogether he weighed 9lb 11oz and it was going to be close between me and him. He also had some pike trouble which has cost him some fish today but he had really enjoyed himself and made the right choice of peg this morning. We walked up to me and when I pulled my net out, I knew it was going to be really tight and was relieved when the needle swung past 10lb and Stuart called it a 10lb 5oz. We got back to the cars as Frank and Baz arrived, they’d weighed 4lb 15oz and 6lb 10oz respectively although Frank said he’d spoken to Jake at Hambridge who’d had 15lb odd and Ben had 10lb something from H4 so I was down to third and we hadn’t heard how they’d done at Redbridge yet! 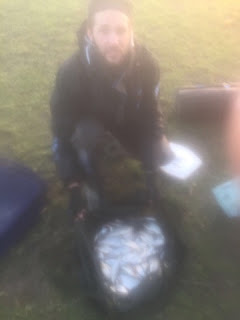 So I ended up third again and picked up £23 plus the all important nugget off of Steve and I have to say I really enjoyed today, I’ve had bites all day and it feels like there’s a lot of fish in the river at the moment, I bet pegs 122 and 129 would have fished today. I also think a few pegs lower down at Hambridge would fish as well, might be worth looking at for the next IBC match. I might actually tweak the format of this a bit to actually reflect how many times a peg has been used because as it stands it doesn’t really show how consistent a peg has been, for example, H1 has only been in twice and won once compared to say 125 which has been used several times but only framed twice so maybe I’ll have a play around with percentages. We’ve had eight different winners so far with Frank Woodard and Adie Bishop the only anglers to win more than one match. 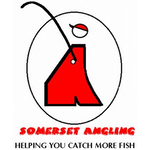 Hurf asked me to remind people that it’s Ilminster AA’s AGM at the bowling club on Friday 23rd February at 7:30pm. 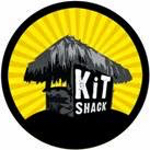 Lastly I’ve got some really exciting news regarding big changes coming to the blog soon, I can’t say too much yet but all will become clear soon enough. 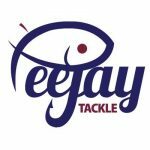 I’ve got lots planned for this year including some great competitions and collaborations so please keep reading and get in touch with catch reports, photos and guest blogs.